on-line database, officially designated PN G75.5+1.7 as Ju1 (Jurasevich 1). and size to the strikingly symmetrical planetary nebula Abell 39 in the constellation Hercules. locating it a mere 1.7 degrees or 119 light-years north of the Galactic plane itself . crude estimate based on a few assumptions but is nevertheless a starting point on discussions about the age of this object. apparent size as measured against the reference star field. create these stunning and highly detailed false-color images of the nebula. Click here to view them. Electronic Telegram No. 1876 (see below). Decl. = +38d02'58" (equinox 2000.0); Jurasevich has posted photographs and other information regarding this nebula at website URL http://tinyurl.com/ku4ppy . nebula at website URL http://www.lostvalleyobservatory.com/page29crescentbubblenb/ . ASP Conf. Ser. 394, 197; Gonzalez-Solares et al. 2008, MNRAS 388, 89) lists an object a couple of degrees away at R.A. = 20h15m22s.2, Decl. = +40d34'44".8.
difficult because of its faintness. The first known observation of a planetary nebula was made by the famous comet hunter Charles Messier on July 12, 1764 when he discovered the Dumbbell Nebula M27 in the constellation Vulpecula. The English astronomer William Herschel quickly added to the list by ferreting out an additional 33 planetaries by the year 1794. Over the intervening years scores of additional nebula have been discovered by amateur and professional astronomers alike. Today they are still being found albeit predominately by professional search programs such as IPHAS and MASH, that data-mine the northern and southern galactic plane in wavelengths conducive to detecting these gems of the Milky Way. 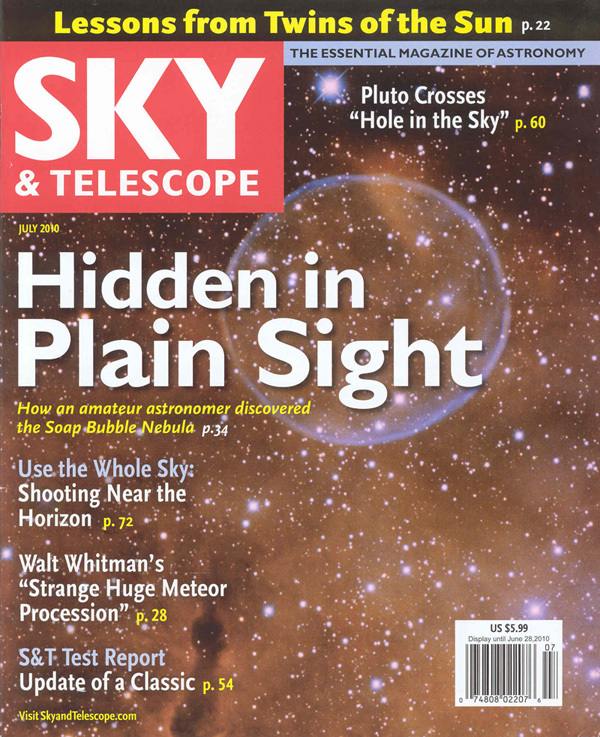 The use of large Earth-based telescopes these current programs employ in their research, coupled with the staggering surveys being conducted by satellites orbiting the planet, make finding a new “non-transient” deep sky object in the Milky Way galaxy or anywhere in the Universe by amateur astronomers a rare occurrence these days. Almost 244 years to the day after Messier discovered M27, a new discovery was made in the constellation Cygnus with modest amateur equipment from the historic Mount Wilson Observatory, located high in the San Gabriel Mountains overlooking the Los Angeles Basin. Beginning on the night of 26 June 2008 and running through 06 July 2008, I was engaged in an ambitious project to digitally image a swath of the Milky Way from Gamma Cygni to the Crescent Nebula NGC 6888 in the Hydrogen-Alpha wavelength (656.3 nm), attempting to capture the beautifully intricate HII regions contained therein. 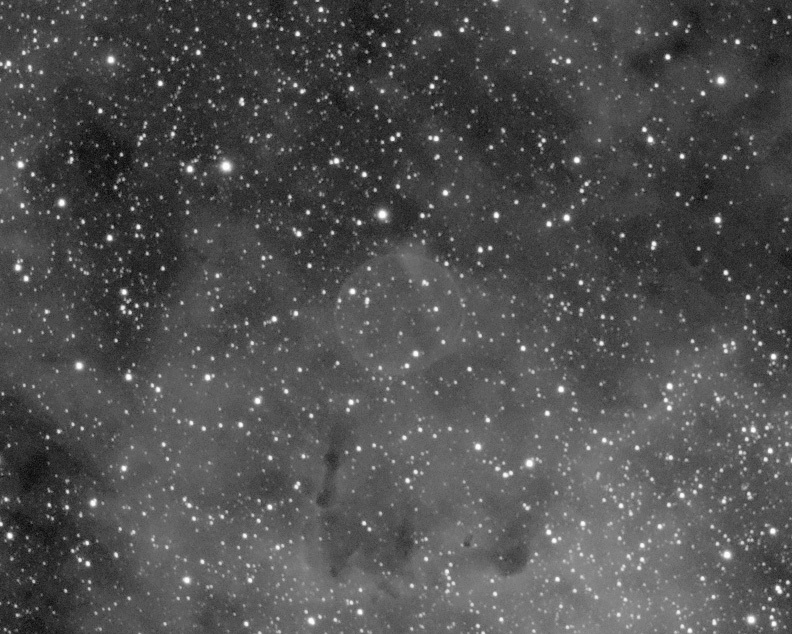 The project, being a multi-night affair, was designed to image eight distinct and slightly overlapping sections of sky and stitch them together into a single, large mosaic using digital imaging techniques well known to most advanced amateur imagers. Excellent weather and exquisite seeing conditions allowed me to essentially complete the project on consecutive nights, finalizing data acquisition of Pane #7 on 05 July 2008 and Pane #8 on 06 July 2008. With these final two panes "in the bag" I completed data collection on a mosaic project having a total exposure time of 32 hours. Exhausted from multiple late-night sessions, I nevertheless decided to immediately begin preliminary processing the last panes of the mosaic (Panes 7 and 8) to determine how they would “fit” into the finished product. 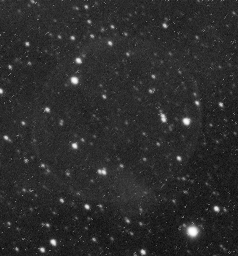 Stacking and combining the twelve individual 20 minute frames of Pane #7 didn’t reveal anything particularly interesting in the faint background of that scene, my eye instead being naturally drawn to the ethereal Crescent Nebula NGC 6888 itself. I decided to do a non-linear histogram stretch on the image to closely examine it for any peculiarities. To my surprise, upon close examination I noticed the faint outline of what appeared to be a nearly symmetrical “bubble” embedded within a faint HII region just a mere one-half degree from NGC 6888. Believing this apparition was but an artifact of my post-processing or an internal reflection in my imaging train, I decided to investigate further by examining an image I had taken of that exact area a year earlier using a different optical configuration and camera orientation. Again, “stretching” the histogram of this earlier image (taken 19 July 2007), I noticed this odd looking object at the very same location. At that point I knew it wasn’t an artifact but indeed a real object of unknown provenance. Discovering a new object in some sense is both a blessing and a curse. After the initial excitement of discovery wears off, the hard work begins. Though still tired from my late-night endeavors, I began what would become an exhaustive search for information on clues to the nature of this odd object I had found. Little did I know where my investigations would lead or to the amount of work that would be required to satisfy my curiosity and ultimately lead to that Eureka moment when I knew I had found something previously undiscovered. Poring over every catalog I could find related to objects of this type and encompassing this area of the Milky Way, I could not find a single reference to this object in the professional literature. My next avenue of research led me to investigate currently running professional programs mining the Milky Way for new discoveries of this type. Again, I drew a blank and became even more convinced the time was at hand to file a report with the International Astronomical Union (IAU) through the Central Bureau for Astronomical Telegrams (CBAT), which I did on 10 July 2008. Cutting to the quick, after filing initial and supplementary reports totaling 53 pages, spending many more hours investigating additional sources provided to me by Dr. Daniel Green of the IAU, allowing review time for the opinions of professionals with expertise in the field of planetary nebulae, and engaging in a cordial series of exchanges in defense of my claim, on 16 July 2009 the IAU issued Electronic Bulletin No. 1876 announcing my discovery of this new object. "The CBAT is the official worldwide clearinghouse for new discoveries of comets, solar-system satellites, novae, supernovae, and other transient astronomical events. 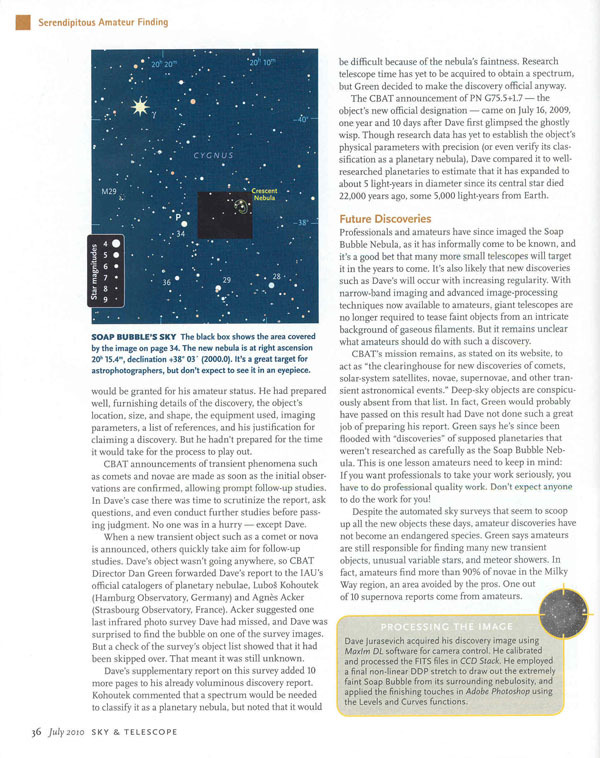 It aims to serve the astronomical community in the spirit of the mandate of the Smithsonian Institution: to aid in the increase and diffusion of knowledge; as such, together with its sister projects (the Minor Planet Center and the International Comet Quarterly), the CBAT serves to lead the SAO in this mandate in terms of public visibility." 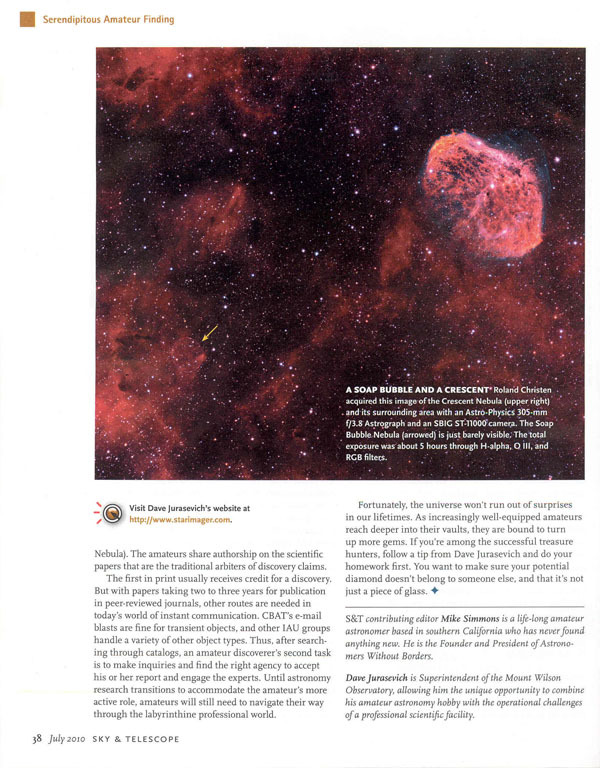 The IAU is really not equipped to handle discoveries of a “non-transient” nature such as planetary nebulae. Thanks to the patient understanding and guidance of Dr. Daniel Green of the IAU however, I was nevertheless guided through the process of reporting and defending my discovery claim. I look upon this as a personal favor by Dr. Green and am forever indebted to him for his guidance over that long year. In hindsight, I now recognize that the more direct path to pursue in staking a claim of discovery is to publish the findings in a professional journal as soon as possible. That can be a daunting task for an amateur astronomer not familiar with or connected to the professional community; however it is the preferred method. Finally, I’d like to leave fellow amateur astronomers with some general insight gained from this experience in the hopes of assisting them in pursuit of this noble hobby. One should never assume that he or she cannot make a contribution to the field of astronomy, believing that amateurs are not equipped to compete with professionals on any level. In this golden age of technology, amateur astronomers are being recognized by the professional community for their contributions. Compared to the level of relatively simple instrumentation available to amateur astronomers just a few decades ago, the powerful and technically advanced equipment of today can and does yield meaningful results. Digital imaging has opened a vast arena of research which amateurs have exploited, running the gamut from taking ‘pretty pictures” to photometric measurements of the periodic dimming of stars resulting from exosolar planet transits. For those like myself who are content with the aesthetic endeavor of producing “pretty pictures”, I urge you to critically scrutinize your images for anything unusual in the field of view before posting them on the Internet. You may find a hidden treasure buried deep among the ubiquitous stars on your image; a gem lying there for countless eons just waiting to be discovered. 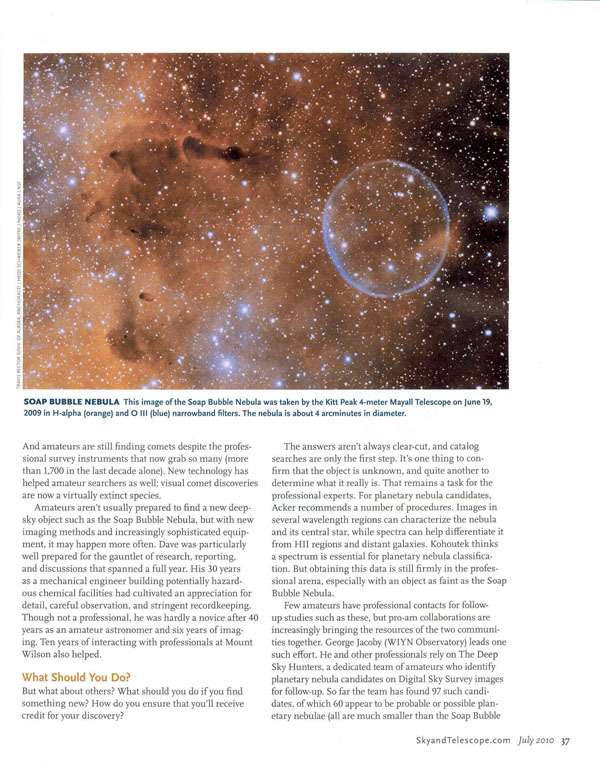 Written by Mike Simmons, a contributing editor to S&T, the article entitled Deep-Sky Discovery chronicles the discovery story of the Cygnus Bubble Nebula and its subsequent reporting and official acknowledgment by the International Astronomical Union (IAU). 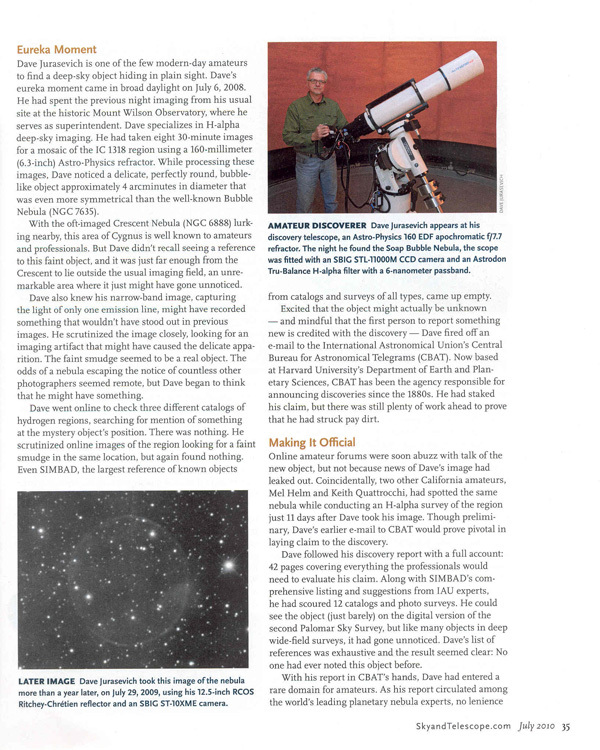 The five page article (pages 34-38) also offers tips to amateur astronomers on the level of research necessary to stake and defend a claim as well as protocol methods for reporting potential discoveries. 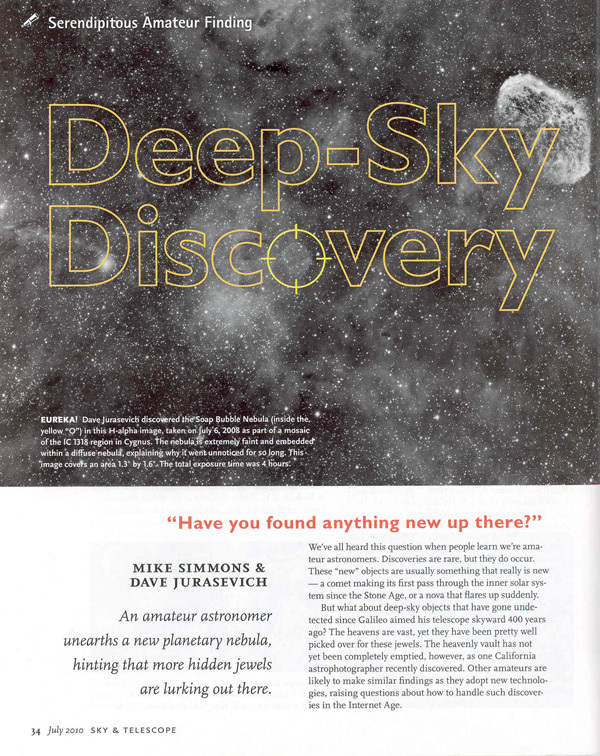 A must read article for future "discoverers" of deep-sky, non-transient objects.